The first Joint Meeting of the Stockholm Convention's Persistent Organic Pollutants Review Committee (POPRC) and the Rotterdam Convention's Chemicals Review Committee (CRC) convened Sunday at the headquarters of the Food and Agriculture Organization of the United Nations (FAO) in Rome, Italy. Clayton Campagnolo, Co-Executive Secretary of the Rotterdam Convention, and Jim Willis, Executive Secretary of the Basel and Stockholm Conventions and Co-Executive Secretary of the Rotterdam Convention, both stressed the importance of work of the POPRC and CRC and called on members to explore how they can cooperate to enhance scientific support to their Conventions and parties. 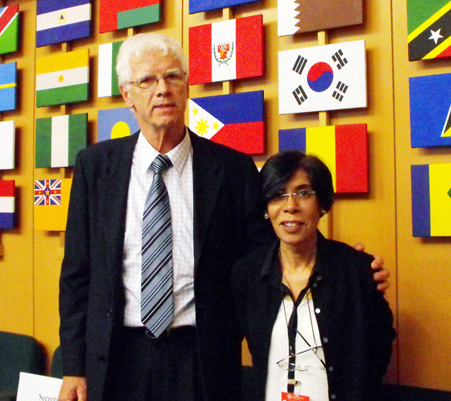 POPRC Chair Reiner Arndt (Germany) and CRC Chair Hala Al-Easa reviewed the mandates and review processes of their respective Committees. On possible alignment of POPRC and CRC working arrangements, discussion focused on promoting participation of observers. 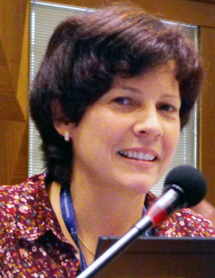 On scientific information exchange relating to review of chemicals, Robert Chénier (Canada) and Sarah Maillefer (Switzerland) presented how POPRC and CRC identify and list chemicals including consideration of impurities. Azhari Abdelbagi (Sudan) presented the CRC’s process to develop the decision guidance documents while Floria Roa Gutiérrez (Costa Rica) presented the POPRC’s process for its risk profile. The Joint Meeting decided that an intersessional working group, to be co-chaired by Mirijam Kristina Brigitta Seng (France) and Azhari Abdelbagi (Sudan) and open to members of both Committees, would convene to develop a guidance assisting parties to the Rotterdam Convention and the CRC in their work when a chemical under consideration is a POP listed under the Stockholm Convention. 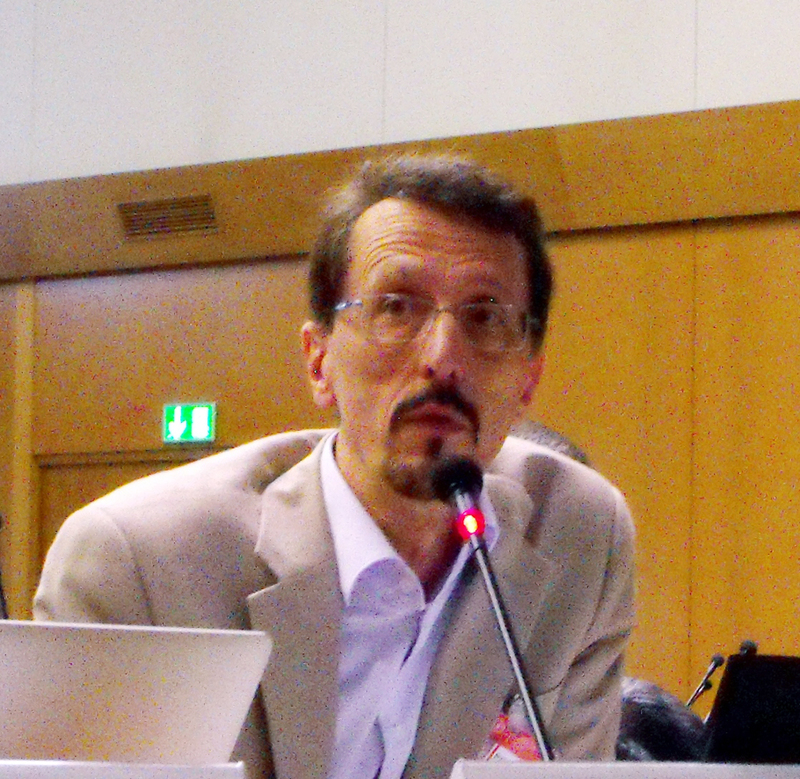 The Committees approved a work plan outlining that the draft guidance can be presented to CRC-10 in October 2014. Discussing further steps to enhance the cooperation and coordination between the POPRC and CRC, participants agreed that the Committees should brief each other on relevant decisions as well as any past work of decisions that might be relevant to chemicals under review. They also agreed both Committees should keep cooperation on their agendas to promote new ideas for cooperation and coordination. Participants discussed consideration at POPRC-10 of ways to work on notifications under Annex D intersessionally in a way similar to the CRC Bureau’s intersessional consideration of notifications of final regulatory action. Other ideas discussed to improve the work of the Committees included asking notifying parties that submit a notification under the Rotterdam Convention of final regulatory action to orally present it to the CRC and answer any CRC member questions may have concerning the notification. Chairs Arndt and Al-Easa indicated their satisfaction with the results of the Joint Meeting, and expressed the hope that it would be only the beginning of cooperation. The meeting ended at 4:16 pm. L-R: CRC Chair, Hala Al-Easa (Qatar); POPRC Chair Reiner Arndt (Germany); co-Executive Secretary Jim Willis, and co-Executive Secretary Clayton Campagnolo, prepare their statements to open the first ever joint meeting between the POPRC and the CRC. 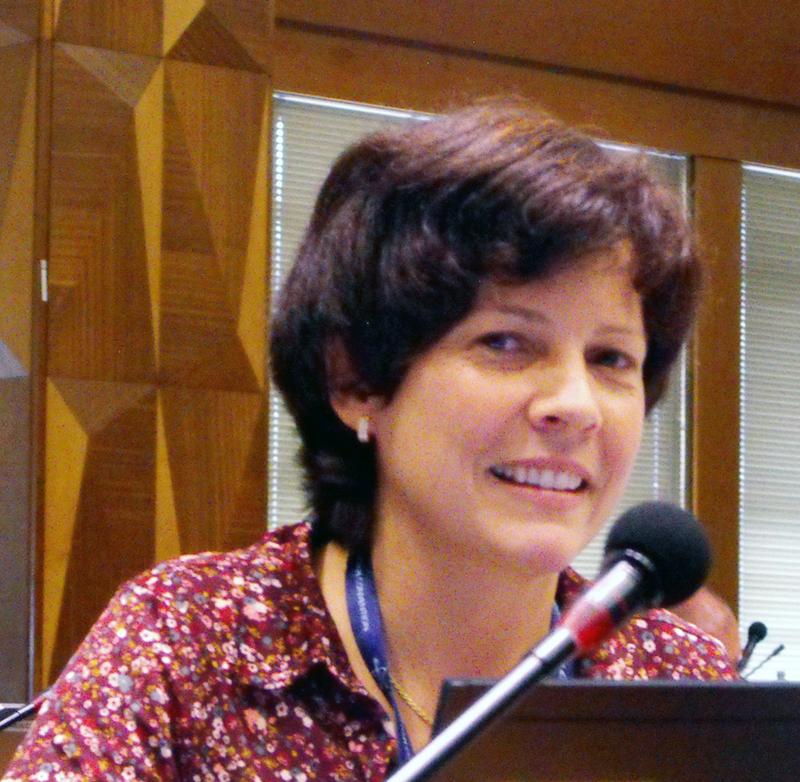 Sarah Maillefer, CRC member, Switzerland, completes her presentation on the CRC’s identification of chemicals and contaminants. 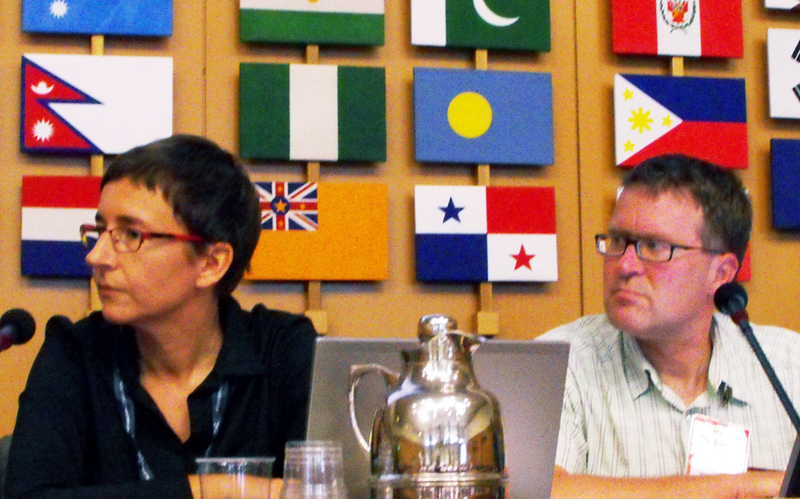 L-R: Anja Bartels, CRC member, Austria, and Martien Janssen, POPRC member, the Netherlands, present on the listing of endosulfan under the Rotterdam and Stockholm Conventions during the lunchtime side event. 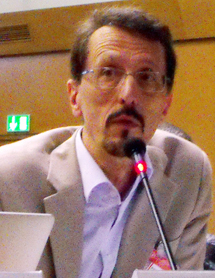 Robert Chénier, POPRC member, Canada, presents the POPRC’s identification and listing of chemicals. L-R: Boniface Mbewe, CRC member, Zambia; Samuel Banda, POPRC member, Zambia; and Francisca Katagira, POPRC member, Tanzania, discuss the Committees’ work. 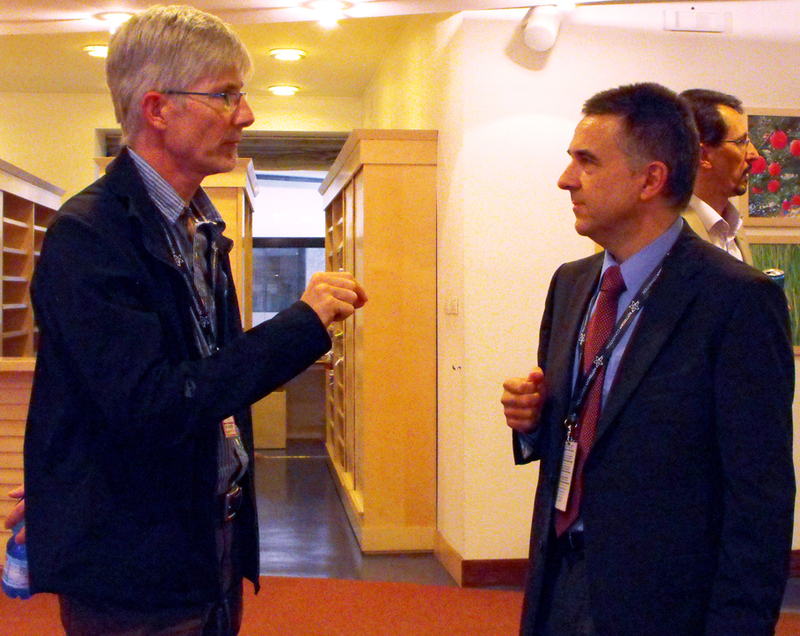 L-R: POPRC Chair Arndt and CRC Chair Al-Easa conclude the joint meeting between the POPRC and CRC. 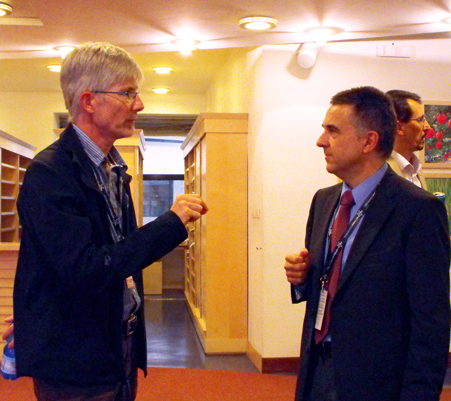 CRC members and POPRC members mingle before the lunchtime side event on endosulfan.